Something is stalking the streets of Gotham. A mysterious being is brutally slaying the villains that normally prey on the citys innocents, a supernatural, demonic creature that looks strangely like a bat. 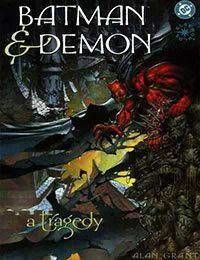 Billionaire Bruce Wayne confronts the menace of the Bat-Demon and learns a shocking secret about himself and those closest to him in BATMAN/DEMON: A TRAGEDY, a dramatic Elseworlds one-shot in the Prestige Format written by Alan Grant (veteran writer of both characters) with lavish painted art by Jim Murray (BATMAN/JUDGE DREDD: DIE LAUGHING). Discovering that not only his beloved manservant Alfred, but even his own memories, cannot be trusted, Wayne uncovers a startling connection between himself and the Demon. When he realizes there is only one way to stop the creatures disturbing murders, will Wayne make the ultimate sacrifice to save the lives of Gothams villains?